October 19, 2017 at 12:05a.m. The Youngstown Playhouse will make Halloween hilarious with “Young Frankenstein,” the stage adaptation of the 1974 movie by comedy mastermind Mel Brooks. Returning to direct the zany musical, which opens Friday, will be John Holt. It will be his first show at the Playhouse since he was its managing director nine years ago. Holt hasn’t done much, if any, comedy in his long directorial career. But his specialty has always been modern musicals with a dark flair and lots of special effects, and for that reason, “Young Frankenstein” is right in his wheelhouse. 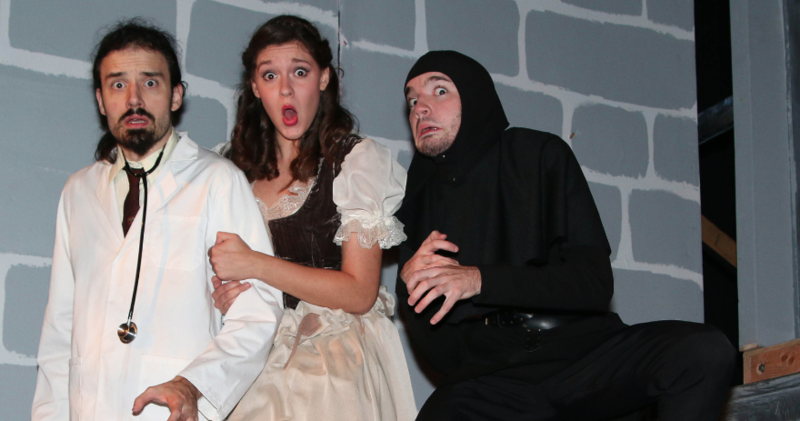 The Playhouse’s production of “Young Frankenstein” is a big one, with a cast and chorus of almost 40 actors. Scene changes are dropped in from above or wheeled onstage in the fast-paced show that is packed with jokes and big musical numbers. It’s a fitting choice for the Playhouse’s first musical of the season. Mel Brooks movies are ingeniously funny, a mix of sophomoric humor and nutball sight gags, poured heavily over a script that spoofs Hollywood and society at the same time. Brooks himself took the lead in adapting his movie to the stage, and even wrote the songs. With a book and music that are loaded with comedy gold, Holt says his job is to just let it happen. The show, said Holt, is chock full of what he calls “delay” jokes. “They register with the audience about seven or eight seconds after,” he said. Delivering those one-liners is a Playhouse cast that has a most unusual twist: Twin brothers play the leading roles of young Dr. Frederick Frankenstein (Denny Monroe) and his misshapen servant, Igor (John Monroe). Their relationship wasn’t obvious to Holt at first. “I didn’t know they were twins at the auditions,” he said. “I didn’t catch it until maybe 3 a.m. They don’t look totally alike, and they auditioned separately, about two hours apart. Another casting no-brainer was handing the role of the monster to Kaleb McFarland. The plot revolves around the return of Dr. Frederick Frankenstein to the castle where his fiendish ancestor raised the dead to life many years hence. The denizens of the town, who are all principal characters, include Terri A. Wilkes as Frau Blucher, Dave Wolford as Inspector Kemp, Sarah Jane Demetruk as Inga, Mackenzie Moorman as Elizabeth Benning, John Cox as the Hermit, and Alan McCreary playing several roles throughout the show. The ensemble includes Amy Banks, Hannah Boyle, Miranda Canacci, Jill Cataldi, Paul Dahman, Sam Early, Lexee Garrett, Lori George, Christopher Hager, D’Ella Heschmeyer, Lindsy Hospodar, Elainie Huncik, Stephen Kountz, Allyson Kremm, Annie Leslie, Frank Martin, Nick Opritza, Selena Phillips, Breanne Reda, Jeanine Rees, Jeremy Sanfrey, Kathleen Sanfrey, Tricia Terlesky and John Weber. Matthew White is the production’s musical director and also designed the set, and Joanna Andrei choreographed the dance numbers. Lighting was designed by Ellen Licitra. Therese Pitzulo created the costumes, and Johnny Pecano is the technical director. September 11, 2007 2 a.m.